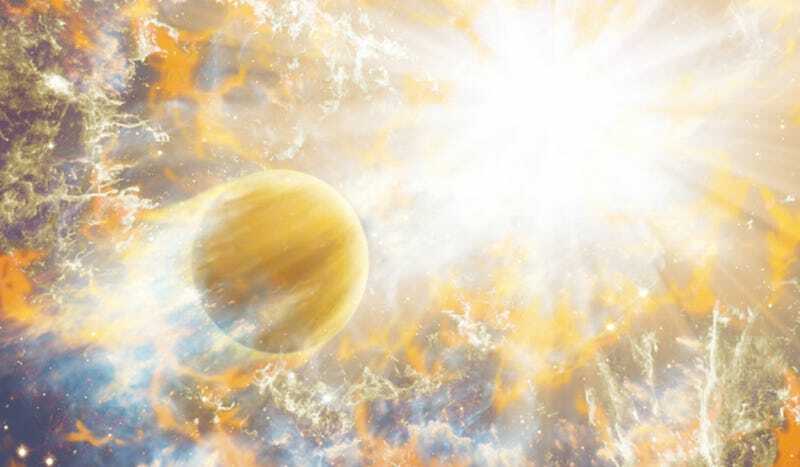 About 1.2 billion years from now, the sun will begin to change. As the hydrogen fuel in its core is used up, the burning will spread outward toward the surface. This will make the sun grow brighter. This increased radiation will have a devastating effect on our planet. Here's what that might look like. The mean surface temperature of the earth will rise from about 68°F to 167°F. The earth’s oceans will evaporate. The planet will become a stark, lifeless desert. Finally, as it approaches the age of 5-8 billion years, the sun will run out of hydrogen almost entirely. When the sun uses hydrogen to create energy, it changes it to helium. After all these years, the core of the sun will be filled with left-over helium. This helium will become unstable as it begins to collapse under its own weight. The core of the sun will become even denser and hotter. As this happens, the sun will swell one-and-a-half times its normal size and grow more than twice as bright as it is now. Over the next 700 million years, it won’t grow any brighter . But it will continue to grow larger. It will swell to more than twice its present size. As it does so, it will cool down a little. From the parched surface of the earth, the sun will look like an enormous orange ball hanging in the misty sky. Ironically, one of the last human artifacts remaining is an ancient Mayan stele. At the age of about 11-12 billion years the sun will blow off more than a quarter of the mass of its outer surface. With a less massive sun to attract them, the planets’ orbits will change. Venus will become as distant as the earth is now, and the earth will move even farther away. Eventually, the ever-swelling sun will become a red giant. It will become 166 times larger than the sun we knew. This is almost as large as the orbit of the earth today. The planets Mercury and Venus will be devoured in the flames of the giant star. The mountains of the earth will melt and flow like red-hot molasses into vast, flat seas of lava. A bloated red sun will fill more than half the sky. ...and Pluto basking in the light and heat of a sun that is even larger in its sky than it had once appeared in earth's. When the sun reaches its maximum size as a red giant, the helium core will reach a temperature of 100 million degrees. This is hot enough to trigger helium fusion. When this happens, helium atoms are crushed together, releasing huge amounts of energy in the process. At first it will seem as though the sun has gotten a new lease on life. It will shrink in size, though it will never get less than ten times its present size. It will begin a period lasting for the next 110 million years during which little change will occur. Just as helium was created when hydrogen atoms fused, new elements are created when helium fuses. Carbon and oxygen are created. As these elements accumulate in the core of the sun, new reactions will set in. Again the sun will swell until it doubles its size. Finally, the core will run out of helium. The carbon and oxygen will collapse, but there won’t be enough for new fusion reactions to start. Out of fuel, the sun will approach the beginning of the end. It will grow to an enormous size as the last gasps of helium and hydrogen are blown away. It will become 180 times larger than the sun we know and thousands of times brighter. Huge quantities of its atmosphere will be thrown off into space, until nearly half its mass is lost. The loss of mass will cause the planets Venus and the earth—-now little more than burned-out cinders—-to move even farther away. The thin shell of remaining helium that surrounds the carbon-oxygen core will become unstable. The sun will begin to pulse violently, like the light on top of a police car. Every time it pulses, it will lose more mass. A final pulse will blow away the last of the sun’s outer surface. All that will be left is the bare core. This will be a sphere about the size of the late earth. This will be extremely hot, but it is just residual heat—-nothing will replace it as it is lost. It is like a hot coal in a barbecue grill, slowly cooling until it eventually becomes a cold cinder. The white dwarf star that was once our sun, seen from the burned-out cinder that is all the remains of our planet.